From the hit Team Fortress 2 video game! The BLU Pyro in amazing detail and articulation. Measures over 6 1/2-inches tall! Directly out of the Team Fortress 2 video game! 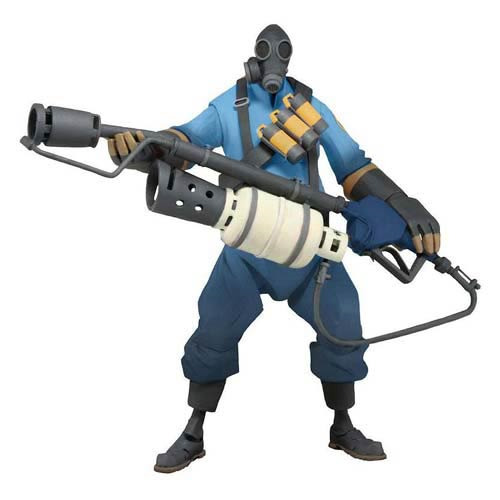 This Team Fortress 2 BLU Pyro Series 1 Deluxe 7-Inch Action Figure has been rendered beautifully and faithfully to the animated look of the in-game character. With over 25 points of articulation and measuring over 6 1/2-inches tall, this limited edition action figure has been recreated in his Builders League United uniform and includes signature flamethrower. A limited edition of just 10,000 figures! Ages 17 and up.